When I spot any of these on a menu, I just can’t resist. I have been known to go into a restaurant especially because I’ve seen an offal dish on the menu they posted outside – Cork’s Crawford Gallery Café often causes such a (delicious) lunchtime problem – or plan a trip somewhere for breakfast specifically based on the fact that they make devilled kidneys. A recent London trip kicked off with a visit to St John Bread and Wine, a restaurant run by Fergus Henderson, the chef, author of Nose to Tail Eating and pioneer of the resurgence in interest in cuts from the fifth quarter. Nice for him, but we’ve been eating all these random bits for years. I might have been terribly picky as a child but offal was always a treat, despite my aversion to other parts of dinner. Potatoes, for example. Never a fan. But put my favourite lamb’s kidney and bacon pie on the table and it wouldn’t last long. Given a chance I would snaffle the rounded, gravy-soaked bits of kidney from any pie leftovers or bring a slice to school for lunch; I took great delight in grossing out the other kids who weren’t such fans. We cooked onion-stuffed lamb hearts for home economics class (cue more disgusted faces from my classmates) and beef tongue was synonymous with the last day of our summer holidays, pre-cooked the night before for an easy cold kids’ lunch while the mammies cleaned our holiday home. Cheap, full of iron and, most importantly, full of flavour, these are ingredients that were the cornerstones of childhood family dinners. Time to revisit them this autumn. 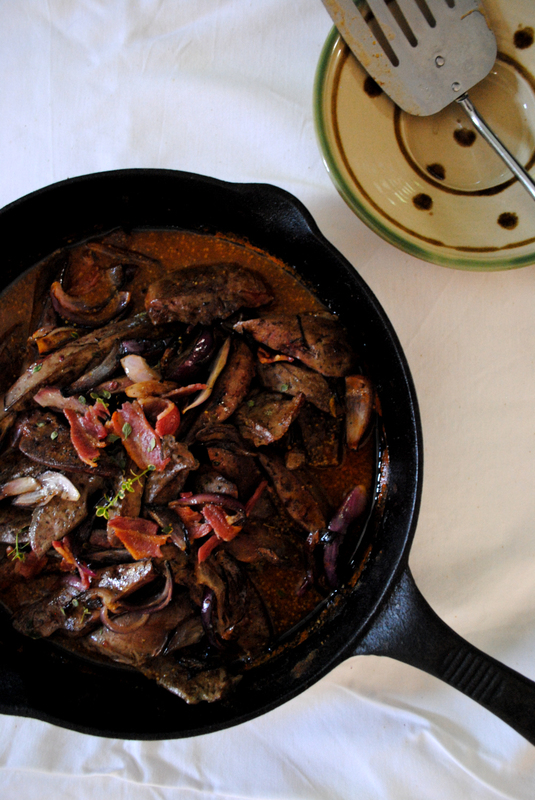 The trick with liver is not to overcook it otherwise it dries out and becomes tough. There’s a great selection of Irish craft ciders available on the market now; check out www.ciderireland.com/members for a list of people who produce ciders from Irish apples. Put a heavy-based frying pan over a high heat. Season both sides of the liver slices. Add 1 tablespoon of olive oil to the pan and, when it’s hot, put in the liver and cook for 1-2 minutes on each side. You want it to be browned but not cooked through. Remove from the pan and keep warm on a plate. In the same pan, cook the onion with the remaining olive oil over a medium heat until soft, about 15 minutes or so. Add the wine, whisk in most of the thyme, the tomato paste, wholegrain mustard and butter then simmer until thick and glossy. Meanwhile, grill the streaky bacon until crisp. Chop roughly. Tip the liver and any accumulated juices into the onions and sauce, heat gently and serve with the crunchy bacon and a few thyme leaves sprinkled on top. Good served over buttery sourdough toast, with mashed potatoes, or on buttered basmati rice. After reading of my love of lamb liver on RTÉ Lifestyle, Helen – one of the mighty Calvey family who run Achill Mountain Lamb – got in contact. They sell hundreds of lambs direct from their farm and butchers to Irish families each year. I was surprised to discover that about 60% of customers aren’t interested in the offal, despite the fact that it’s included in the price. She brought me some spare liver and hearts to play with; the result is above. I was not paid for this. Looks delish! That’s a favourite NZ tea for me. 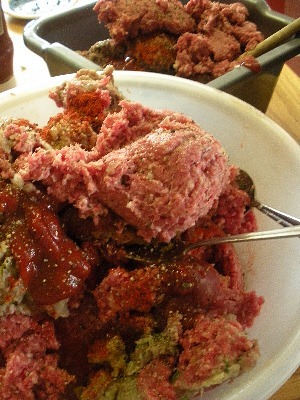 Missing Fred Eskrick’s Butchery in Dunedin right about now..
Lamb’s fry! The Kiwi once ordered that at a restaurant in Christchurch and was very unimpressed when liver arrived instead of the imagined chops. Still makes me laugh!